For the longest time, I was self-conscious about my scar. I was made fun of for YEARS; yes- years. Between the “zipper” that goes between my breasts down to a few inches above my navel along with the numerous chest tube scars, including one between my “zipper” and my navel that everyone called a second belly button. Growing up getting picked on for scars was rough, I think it was more difficult than getting picked on for the “normal” things like wearing glasses, having a certain color hair, etc. I was afraid to wear clothes that showed my scars, I was afraid to tell my story, I was afraid of what others thought. Eventually, I realized my scars are just part of my story. Now that I am almost 26, I embrace my scars and my story and I realize they are like my tattoos; the scars have meaning and tell a part of my story and I wouldn’t be here without them. 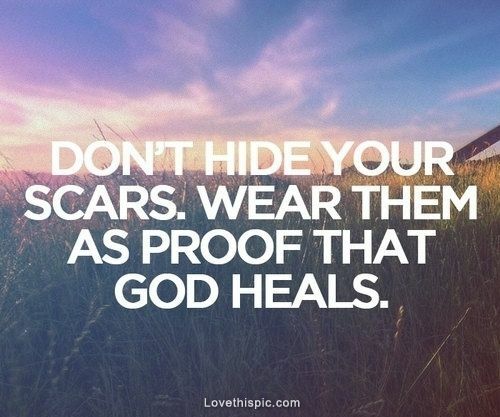 I looked on Google and Pinterest and found loads of quotes about embracing your scars. CHD affects 1 in 100 people, your scars make you unique just like each heart defect is unique. It doesn’t matter if two people have the same defect, chances are their cases are not identical. I like to refer to scars as battle wounds, you have endured a battle be it physcially, emotionally, or whatever but you won your battle and you are still here. You are a WARRIOR. Never forget that. It took me until I was an adult until I was comfortable in my own skin, even when I married my first husband, I was so ashamed for him to see me naked because I didn’t look like “all the others” well guess what, NEWS FLASH: no two bodies are identical. So I am still slowly learning to embrace it, some days are better than others.